This is the home of the Central Pennsylvania Chapter of the Construction Specifications Institute. Please come on in and look around. We&apos;d love to see you at a meeting or other Chapter event! The Construction Specifications Institute (CSI) is a nation-wide nonprofit technical organization dedicated to the advancement of construction technology through communication, education, research, and service. Founded in 1948, CSI provides a forum for architects, engineers, specification writers, contractors, suppliers, and others in the industry. Central PA Chapter CSI’s April meeting will be a joint tour and dinner with the Central PA Chapter of the American Society of Professional Estimators. This will take place on Wednesday, April 10, with the tour scheduled to run from 2:00 to 5:00 p.m., followed by dinner at a yet-to-be-determined restaurant. 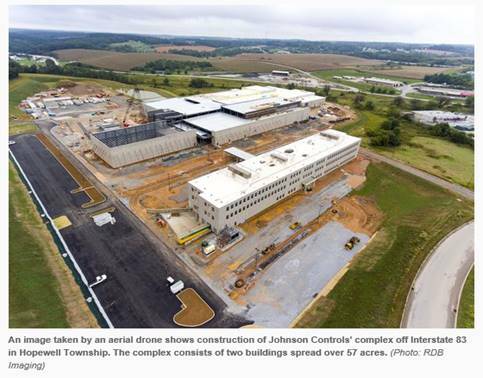 We will be touring the new Johnson Controls Advanced Development Engineering Center in New Freedom, PA, just off the Shrewsbury Interchange of I-83 (Exit 4) in York County. According to York Daily Record articles from 2016 & 2017, this was a $150 million development on a 57-acre site, with 107,000 sq. ft. in office space and a 286,000 sq. ft. of lab for development and testing of industrial-sized air conditioning chillers in connection with JCI’s York Manufacturing presence. Construction started in 2015 and occupancy began in 2017. As usual with our programs, CPC CSI will register this tour with AIA CES for continuing education credit and offer CE certificates to all attendees. The ASPE chapter is making the arrangements for this event, and more details will follow, but they are asking for a dinner attendee count by Tuesday April 2, so they know how big a group we’ll have at a restaurant. Accordingly,please e-mail directly to our program chair person by 4:00 p.m., Tuesday, April 2, (Chris Atwood - catwood@gfnet.com )if you plan to attend the tour and dinner or just one or the other. This includes those of you with a standing reservation (i.e. there are no standing reservations for this event). I’m sure some adjustment will need to be made between April 2 and April 10, but please try to RSVP with affirmative reservations by tomorrow. Dinner cost is included for current Central PA Chapter CSI members, $10 for students, $25 for all others.